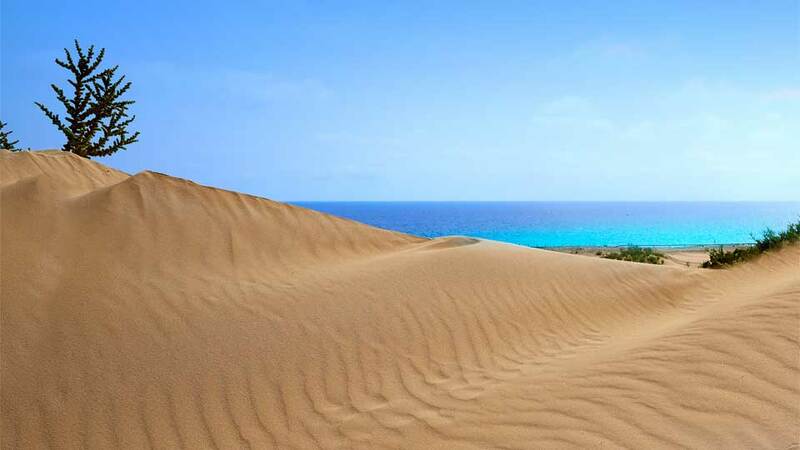 Fuerteventura is a perfect blend of arid landscapes, sleepy fishing villages, and fantastic beaches. It is the second largest island in the Canaries where visitors get lost in its rolling dunes, bizarre volcanic rocks, and stunning dormant volcanoes. With villages unspoiled by tourism, it’s an interesting subject for those with culture-seeking eyes. Its eternal spring-like weather and the lovely waves along its 150-kilometer coastline welcome thrill-seekers all year long. The unparalleled beauty of geological formations in Fuerteventura are byproducts of volcanic eruptions over 50 million years ago. Believed to be the oldest among the islands in the archipelago, the last episodes of volcanic activity date back to 7000 years. That said, the island is now a quiet landscape of contoured rocks and stones, with the largest reserve of sand dunes, and beaches that either sing in tranquility or shout in waves. The island’s original inhabitants were called the Majoreros, taken from the word “Maho,” a type of goatskin-made shoes they used to wear. The remaining evidence of their Pagan rituals still exists today in incredible visual stories told by excavated caves and holy mountains. In 1405, Spanish conquerors led by Norman Jean de Bethencourt invaded the island and its people. After establishing settlements in Bentacuria, its first capital, they braved several pirate attacks in the 15th and 16th centuries. These forced the people to build castles and fortresses and to settle inland. In the 1800s, the island’s capital became Puerto del Rosario. The words Fuerte (Strong) and Ventura (Wind) forms a suitable name for this beautiful island. Today, Fuerteventura is a picture of several ancient neoclassical churches and stunning dry terrains. Its borders are long, impressive beaches. Its inhabitants are a charming people who embrace fishing and cheese-making. With its year-round sunshine, long and varied coastlines, rich marine reserves, and trade winds that invite the most exciting waves, Fuerteventura’s beaches have gained international recognition over the years. Visit and discover why many believe that some of the best beaches in Europe are found here. From Morro del Jable, a drive towards the west coast through mountainous dirt tracks reveals Playa de Cofete. The bone-rattling drive through the unpaved roads is rewarded by clear blue waters and light golden sand opposite the towering and cloud-kissed Jandia Mountains. But more than a wondrous sight to behold, the virgin beach is the perfect place to feel peace, away from modern developments. To really experience the unique kind of tranquility only found underwater, there are a couple of teams offering dive tours and lessons around the area. 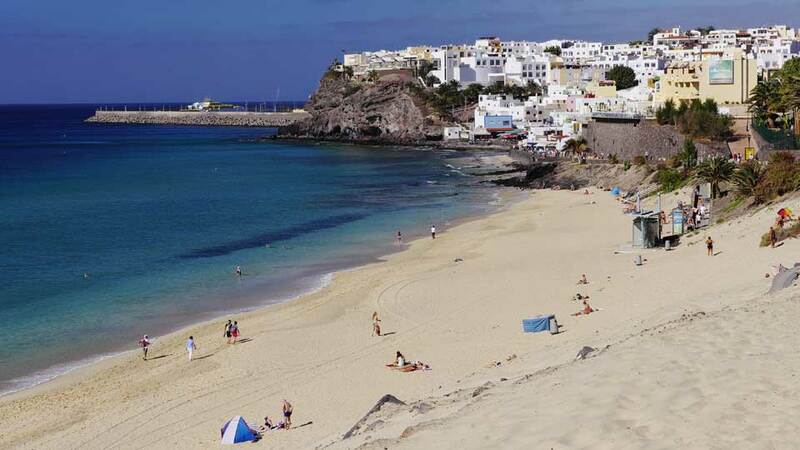 Found northeast of the village of El Cotillo is a white sand cove beach and lagoon. Here, tranquil turquoise waters during low tide produce small natural rocky pools. The sunset is also spectacular, creating a vivid picture of orange skies over the blue horizon. With gentle waves, the area is ideal for novice surfers. But strong winds sometimes create bigger waves, so even professional surfers love this northern gem. With a 9-kilometer stretch of fine golden sand, Sotavento beach in Costa Calma seems like an endless paradise. During low tide, guests feel like microscopic dots amidst the vast shoreline and the Atlantic. Sotavento is composed of five beaches, so there’s a spot for everyone, even the naturists. But what sets it apart from the rest are the constant trade winds and giant waves that make it suitable for water sports. As such, it has been a regular venue for Wind Surfing and Kite Boarding world championships in summer. Grandes Playas Corralejo is world renowned for its shape changing Corralejo dunes. Hugging Corralejo Natural Park, it is an unmistakable beauty that displays the sun and the sea. The north end of the beach is family-friendly while the south end is nudist-friendly. With sand which eroded from sea shells, it’s like a giant natural spa for those who wish to sunbathe. This popular spot also attracts all sorts of adventure-seekers like surfers, wind surfers, kite surfers and even jet skiers. Those who love fishing and kayaking also head to its harbors. Pitch black volcanic sand, steep cliffs, and course caves form a dramatic seascape in Playa de Ajuy. It’s easy to stand in awe as powerful waves crash into the rock formations over and over again as if trying to break it in half. By sundown, tourists are mesmerized by the peaceful sunset bringing burning hues to the sky. Tourists may opt to spend an adventure-filled afternoon trekking the path leading to the Ajuy caves. Once hungry, let those two feet lead to one of the restaurants serving sumptuous meals up in the sleepy village. Playa del Matorral in Pajara is one of the best and cleanest beaches on the island. With sunbeds and parasols adorning its light yellow to golden sand, it’s no doubt a favorite among locals and tourists. The promenade with restaurants and shops just beyond the shore makes it an ideal holiday destination for families. The waters here is ideal for a good dip, and the weather is always pleasant for walks and for lounging around. But the best part is that the gentle waves and trade winds make it perfect for kite surfing and wind surfing. 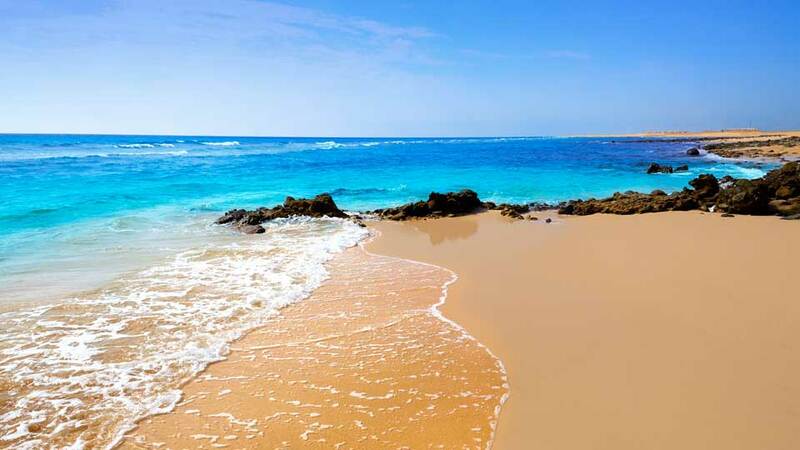 This lovely beach situated in a quiet old village in Gran Tarajal has some of the darkest sands in Fuerteventura. Playa de Gran Tarajal is a great place for families with its calm waters and lines of stores a few yards from the beach. The place is completed by a marina where small fishing boats are docked. Those who have a penchant for fishing should pay a visit to its harbors. It’s one of the finest places where guests experience having their next seafood lunch caught right before their eyes. Another white sand beach south of the island is Costa Calma. The 2-kilometer stretch of sandy shores is paired with elegantly eroded ochre mountains. The turquoise waters are protected by walls of hotels and apartments, keeping the beach idyllic for swimming. Furthermore, at the southern end of the playa, the waves of the Atlantic make it a magnet for windsurfers and surfers. A couple of hotels also offer various water activity options like jet skiing. Scuba divers and snorkelers also frequent it. Being the oldest island in the Canaries has its perks. Aside from having a longer history to tell, Fuerteventura is packed with culture-rich landmarks, neighborhoods, and museums which stood, and still stands, as witnesses to the island’s pronounced legacy. The church found in the town up in the valley holds secrets to the island’s past. During the 15th century, pirate attacks destroyed the town, along with Iglesia Catedral de Santa Maria de Bentacuria. The residents’ determination paved the way to rebuild a stronger church, now seemingly an immovable fortress in Norman Gothic interiors. The church’s whitewashed walls with brown accents carefully house a museum with some of the most beautiful wooden carvings and paintings. Well loved by visitors because of its tranquility, it’s a historic refuge away from the hustle and bustle of tourism on the island. The oldest church in Antigua completes the nostalgic village’s old town appeal. With walls painted white and a bell tower on one side, it’s a typical ancient architecture built in the 1500s. A very good time to visit the place is when the town holds its week-long celebration to honor the patron saint. The usual peace of the whole area transforms into an atmosphere of cheerful Spanish festivities. No place on the island offers quite the same extravagant views like that in Mirador Moro Velosa. Designed by the very creative Lanzarote local, Cesar Manrique, this viewpoint blends easily with its surrounding. Inside, visitors get a panoramic view of the endless biosphere reserve of hills and valleys of the island in varying beige and brown hues. This is a break from the usual beach and sand dunes. Enjoy a cup of coffee while learning about the volcanic past and examining the miniature model of Fuerteventura. To experience an old tourist town that feels almost entirely exclusive for Germans, drive to the south of the island in Morro Jable. Once a sleepy fishing village, progress took place and claimed the town in the 1980s. Since then, lines upon lines of stylish hotels and apartments sprung out around the area. Stop by the 4-kilometer beach sprawled with fine golden sand kissing the cool and calm waters. Or take a stroll and dine at the shop-filled promenade at night. Snap photos of the Jable lighthouse and the iconic sperm whale bone structure as you chance upon wild friendly chipmunks and parrots. Just a few minutes from the tourist towns of the island in the north lies Lajares. This quaint village is known for its interesting local shops selling Canarian crafts, the most popular of which has to be Artesania Lajares. One can argue that apart from the many great finds on its Sunday market, it houses some of the best restaurants and bars on the island. Lajares also has a surfer town vibe, with the presence of quite a number of sports shops. But the best place to visit for a dreamy photo shoot is found south of the town, where two old windmills seem to stand as guards to the town’s church. One of the most picturesque towns in Fuerteventura where history and culture collide is Bentacuria. Since it was the capital of the island until 1834, the place is bursting with colonial vibes, from rebuilt gothic churches to artsy shops, to local restaurants offering Majorero cheese. A must see when in town is Mirador Guise Y Ayose, a viewing center which boasts of a fascinating 360 view of the island’s barren north and the whole of the village. Guarded by magnificent giant statues, the place is truly a captivating stop. The name says it all. The Museum of Traditional Fishing in El Cotillo gives visitors an excellent overview of the life of fishers long ago in the island. Follow the lovely walking trail that starts and ends in the old lighthouse, then learns a little something about fishing along the way. There’s a cafe, as well as a stunning nudist beach nearby. A short drive in a hidden road in La Oliva is all travelers need to get to this piece of art heaven. Centro de Arte Canario houses plenty of photos and artwork of traditional and contemporary Canarian artists in its underground gallery. Aside from the unique Cacti Garden and Sculpture Garden, a cafe and a souvenir shop allow visitors to have an unforgettable touristy experience here. The Salt Museum shows guests everything they need to know about salt, and more. From production to function, and even to its history, there’s more to know about this staple in our kitchen. Luckily, the museum offers two tours which complement each other. No holiday is complete without good food. In Fuerteventura, the fusion of Spanish, Mediterranean, and a plethora of other cuisines featured in most restaurants is sure to leave visitors hungry for more palate adventures. Carefully tucked away in the old part of Corralejo is the popular bistro, The Ugly Duckling. Don’t be fooled by the name though, as there is nothing ugly about this place. From its dark wooden tables to its Danish, Scandinavian, and International menu, the owner has mastered the key to keep people coming back. Try their stew and Danish beef, then finish with a local Lanzarote wine from their expansive list. The chic white and blue interiors of El Mentidero Cafe Restaurant in El Cotillo reminds patrons of the calm and sunny sea. Run by a young couple, service is impeccable, and the food brings comfort to hungry tummies. Try their wide selection of coffee, fruit drinks and brunches, and then grab a bite of their mouth-watering carrot cake. Even non-Vegans love this little relaxed restaurant in La Oliva. With a lovely Italian owner who offers brunches and lunches, their menu features endless healthy options for burgers, sandwiches, shakes, and more. Make sure to try the Vegan burger and find out what all the fuss is about. Just a street away from the town church in the capital Puerto del Rosario, La Jaira boasts of well-plated European, Spanish, and Mediterranean dishes. Dine al fresco on the terrace or choose a seat inside, but don’t ever miss their bread served with various flavored oil dips and salts. Although many of the local villages in Fuerteventura remain untouched by modern developments, there are plenty of choices for accommodation in its tourist towns. This 2017 Traveler’s Choice award recipient from TripAdvisor is a home far away from home. Avanti Hotel takes pride in their fabulous service, clean and stylish white and blue interiors, and comfort food choices. Nestled on the coast of Corralejo, it is a stone’s throw away from shops, cafes, restaurants, and bars. To cap the experience, watch the breath-taking view of the sunset over Lobos Island from their rooftop. In Bahiazul Villas & Club, travelers no longer need to imagine a perfect holiday. They offer a unique option to stay at fully-furnished charming villas with the amenities of a hotel. Make the most out of a Fuerteventura vacation with their fitness center, in-house restaurant, bar, spa, tennis court and hot tubs. The first-class service offered by their professional staff makes anyone’s stay a perfect holiday. One of the best options when traveling with kids is the family friendly Barcelo Castillo Beach Resort in Antigua. A short walk outside will lead to either the town or the beach. But for those who want to enjoy staying out of the sun, they have complete amenities including a fitness center, tennis court, bar, restaurant plus a number of pools, and a playground to keep the kids entertained. Perfect for couples who wish for a romantic stay is Hotel Elba Palace Golf. With colonial architecture featuring wooden furniture and elegant rooms surrounding a courtyard, it is a piece of heaven on Antigua. Apart from excellent amenities like pools, restaurant, tennis court, gym, and bar/lounge, the hotel is also home to the Clubhouse of Fuerteventura Golf Club with its 18-hole golf course. As with any other tourist destinations, traveling to Fuerteventura doesn’t come with zero health and safety risks. But since the island is relatively safe, only the most general precautions are advised. When an emergency occurs, remember to dial 112. But to be certain that medical attention is nearby, research about the closest hospital or health facility. It’s also important to bring the standard European health card for health insurance. Usual health and safety hazards in the island involve the beach. For instance, staying out under the sun for too long without a sunscreen lotion, even if it is windy, is an absolute way to get sunburn. Moreover, it is widely known that swimming in its shores must be done with respect to the warning flags around the beach as waves from nowhere could come crashing at any given time. Lastly, it is worthy to note that travelers need to be extra careful not to be victims of tourist traps. To avoid becoming a victim of pickpockets, bring only the essentials and lock everything away in the hotel safety vault. Traveling to Fuerteventura is much like going to any other island in the Canaries. One can choose to fly or to sail. Flights to the airport are available in most European airlines. 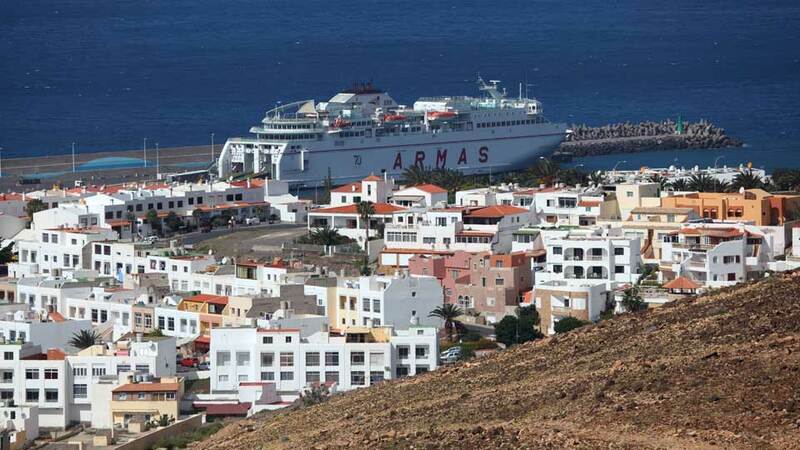 Meanwhile, ferry boats are the best way to go if arriving from Spain or if traveling to and from the other Canary Islands. From the airport, tourists may opt to take a bus, hail a cab, or drive a rented car. If traveling by bus is going to be a favorite mode of transportation, it is best to buy a rechargeable plastic bus card which offers around 30% discount for each destination. Take the Number 3 bus if going to Puerto del Rosario or Caleta de Fuste and the Number 10 Bus if going to Morro Jable. Taxis are always waiting outside the airport. There are standard meters but expect additional charges for airport pickups, night trips, and holiday travel. An ideal way to explore the whole island though is through rental cars. Many cheap options are available, and most roads are easy to access. 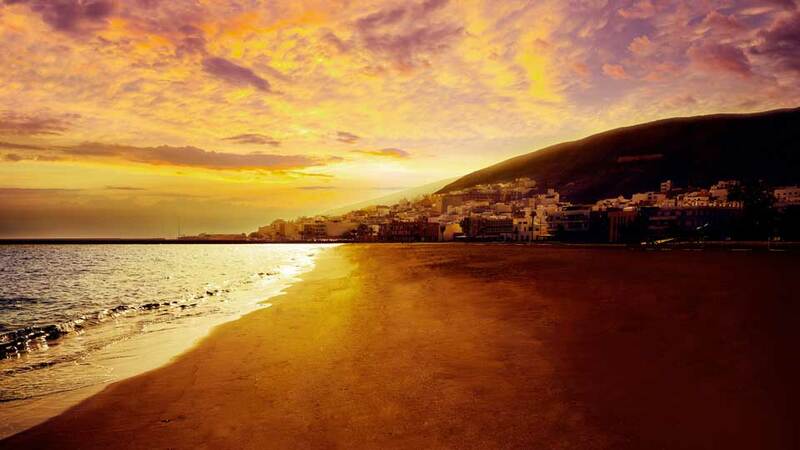 Only a few destinations in the world can top the serenity and splendor of the beaches in Fuerteventura. 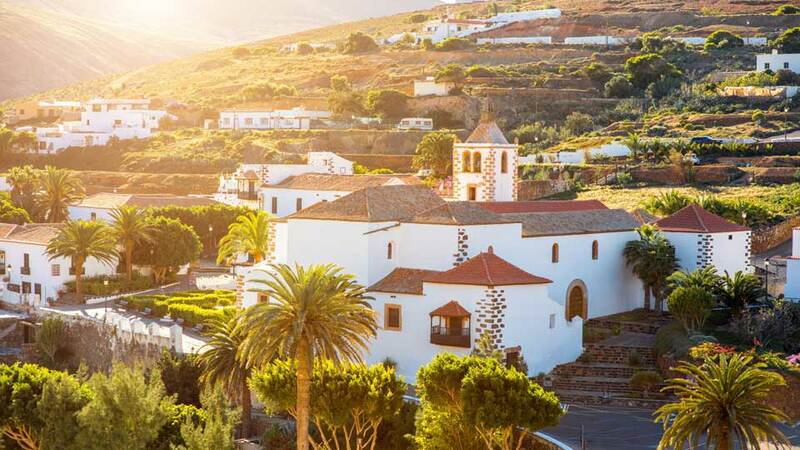 Just 100 kilometers off the African coast, and politically part of Spain, the oldest island in the Canaries has managed to preserve the original atmosphere of its small fishing villages. Despite unparalleled popularity among beach-goers from all over Europe, nature in these parts of the world remains pure. It is precisely why it was declared a UNESCO biosphere reserve in 2009. Take a pick among a myriad of beaches, dip in clear, emerald green waters, or experience a different kind of thrill while battling its world-famous waves. For something more mellow, tour the nostalgic sleepy towns which cradle the island’s history through imposing fortresses, Gothic churches, larger than life sculptures, and beautiful windmills. Taste the tempting cuisines made from fresh seafood, wines from volcanic mineral-rich vineyards, and the local Majorero cheese with a designation of origin. Better yet, stay in one of the comfortable and stylish hotels and villas for an extraordinary respite. 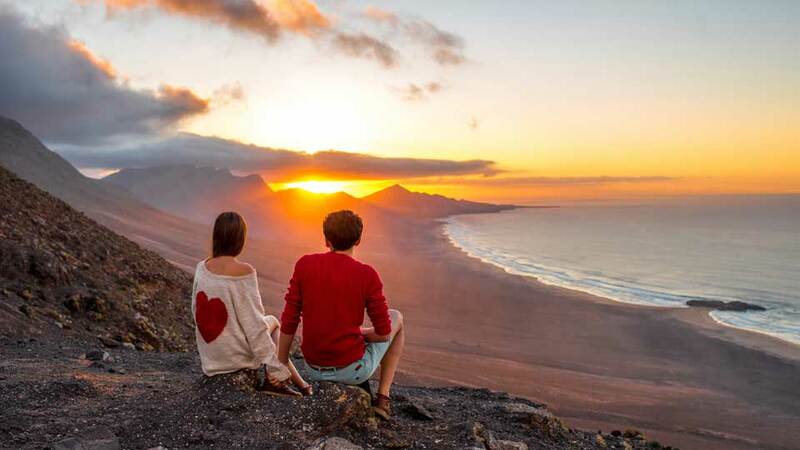 Discover why the exquisite brew of the sun, sea, and sand in Fuerteventura is more special than that of any other beach destinations in the world.